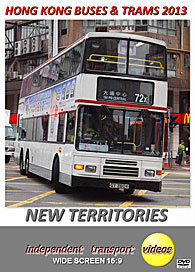 The third part of our Hong Kong Buses & Trams 2013 trilogy encompassing the New Territories. This vast area that borders Mainland China is just as interesting to the transport enthusiast as Hong Kong Island and Kowloon. Apart from featuring the three main bus companies; KMB, New World First and Citybus, there are also buses in the liveries of the MTR, both East and West Rail varieties, Long Win and buses from New Lantao Bus and other Non-Franchised operators seen operating. There is of course the Tuen Mun Light Rail system that runs in the western part of the Territories for added interest. There is plenty of action as we start off at Sha Tin. KMB have a large depot here as well as a training school, so there are plenty of training buses out on the road, made up of recently withdrawn air-con Dennis Dragons and Volvo Olympians. We also film at the upper bus station in the town. Our cameras then move along to Tai Po, where we film in the busy street and the Uptown Plaza bus station where we see the immaculate grey, red and off white liveried Enviro 500s of the MTR East Rail fleet in action. Sheung Shui up near the border with China is next, as we film in the busy streets and the town’s bus station. We then take a ride on board AVC4 (PE 5293); a KMB MCV bodied Volvo B7RLE on route 73K. This route takes the closed road to Man Kam To through a ‘closed area’. As we did not have the relevant visas for travelling to China we had to alight at Cheung Po Tau, at the border post, where we waited for AVC4 to return for the ride back to Sheung Shui. Tin Shui Wai is the next location and a new one for our cameras. A busy town with a network of lines for the Light Rail system. Here we captured the brand new Enviro 500NG (New Generation) buses in the MTR West Rail livery. We then make a return visit for 2013 to Yuen Long. Filming takes place along the busy Castle Peak Road featuring the buses and the Light Rail. We also call at the bus station on Kik Yeung Road. After a brief visit to the Light Rail station at Siu Hong we arrive at Tuen Mun to film the action. Our final location on this 2013 visit is Tsuen Wan. A good place to complete our filming, as there are plenty of white air con Dragons and Olympians to see, as well as many mid life Dennis Tridents with a few Wright bodied Volvos and Enviro 500s to complete the picture. We end the programme by jumping on board a short (9.9m) Dennis Dragon, ADS76 (GT 5992) on route 38A to Mei Foo. This bus is due to be retired on the 14th April 2014. We hope you enjoy the ride! Duration : 74 minutes (approx).